Looks like I'll have to schedule an appointment with my local MB Dealer. Got my command system updated last week. When I went into command online I noticed they now have a Facebook icon so you can now update your location directly into your Facebook profile. 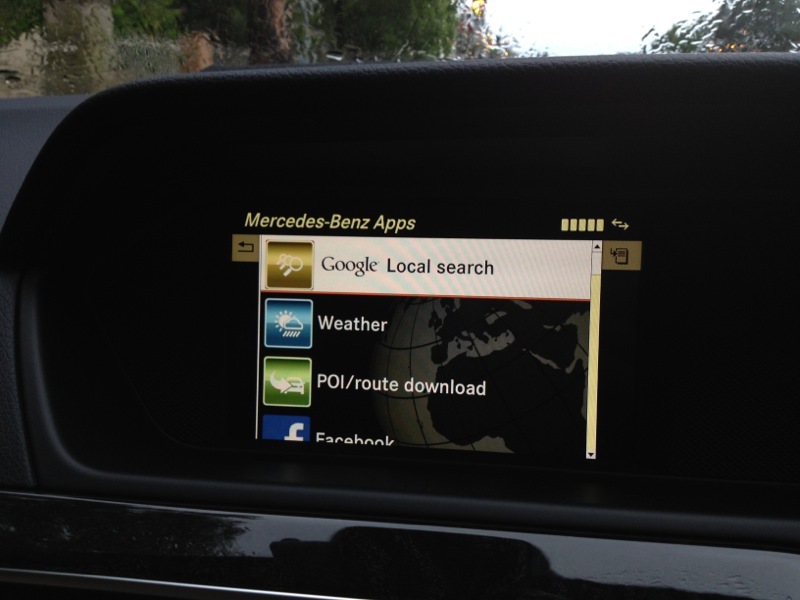 Good to see that Mercedes is slowly improving their interface. Now if only they update their internet connection to support wifi and PUN. Scheduled an appt online last night. Received a call today, told them that there is a "volume issue, sound is really low, ad doesn't get louder, and is intermittent." They scheduled me for an appointment tomorrow to reflash the COMAND firmware. Updated. Awesome change. There are a lot more options than the original '08 firmware/software. He said he updated with three separate updates. One was the navigation, one was stereo and one was COMAND. So I am now given the upcoming exits, and the POI at those exits. I also like the "block area" feature. Very happy that this update was taken care of. What an awesome upgrade. I did take in 2 dozen donuts... That might have something to do with the map update. Beancooker, thanks for the update. Now I'm really mad my dealer told me there is no update for mine. Does yours look like the images posted here? I have my car at the dealer today for another repair. I've been having issues with my speech button. When I'm in Nav mode, I push the button to enter a destination and it kept getting stuck on LOADING SPEECH DATA. My S.A. said they found the issue and that they'll be updating the firmware for me. I think I already had the latest version, but not sure. Yes, it looks just like that. I told them that the volume was intermittent and that a lot of the time I would start the car and the volume would be low, and wouldn't want to adjust. I said that I can have it turned up to a nice level, and when I get back in it is low. I also said that it happens with CD's and the music register. But since it is intermittent, I can't replicate the problem on demand. Why do all the dealers in my area not know anything about this update? 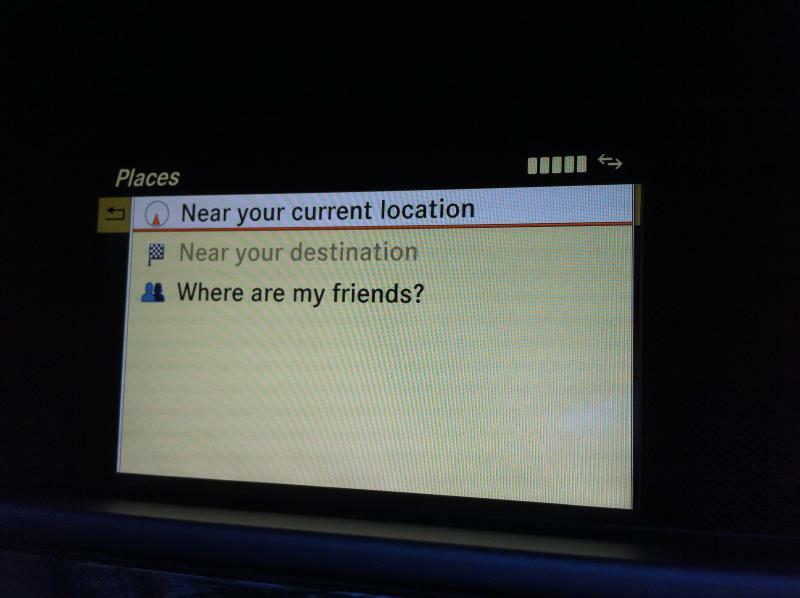 They keep thinking it's the nav update & are trying to charge me! Because you say software and explain that you don't want a map update? Tell them the COMAND firmware. Or, you can say what I said: I told them that the volume was intermittent and that a lot of the time I would start the car and the volume would be low, and wouldn't want to adjust. I said that I can have it turned up to a nice level, and when I get back in it is low. I also said that it happens with CD's and the music register. But since it is intermittent, I can't replicate the problem on demand. Chad could you possibly post some pics showing the comand online menu with facebook and show the version number of your software. 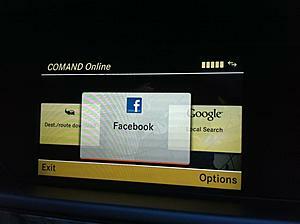 Sorry about the late reply here are a few photos of the Facebook app on the COMAND online. No probs Chad. Thanks for posting the pics. Just realised you have a 2012 car with the fixed screen. I dont think this update will be available for my 2008 model which I guess will be using an older comand HW. I updated my Comand NTS V8 Europe navigation with V9 (not an official copy!) and now it won't eject disc1 when the request to insert disc 2 comes up on screen. Any ideas on how to remove manually? Dealer's going to charge me the earth probably - is there another way? I had a similiar problem with mine about 6 months ago. I remember having to remove the key from the ignition shutting the comand system down then reinserting the key and switching on the ignition. I cant remember if it allowed the unloading of disc 1 or loading of the second disc into an empty slot. Either way I managed to get the second disc in and the updating sequence complete. Got my system updated again last week and noticed that they have changed the layout for the comand online menu. 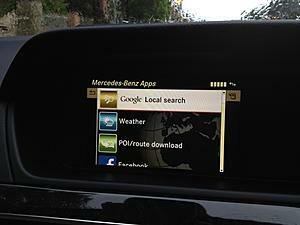 Its been renamed Mercedes-Benz Apps. All the options now appear in a list, with coloured icons. Looks like we may be apple to download apps in the near future! Teb, Thanks. Finally got it sorted by hitting the #6 key (this was the position of the DVD disc #1). It thought about it and then ejected it, so I was able to put DVD 2 in and complete the install. Now I have to persuade my dealer to add the Comand firmware update (which they deny all knowledge of). No probs. I had the same problem with my local dealer in Cambridge.I ended up taking it to Bedford in the end. The guys there were very helpful but might be a bit of trek for you. Be careful with the firmware update. My system crashed during the update and wouldnt load the new firmware. I dont know if this had anything to do with the nav update i did?? Had to do without the whole Comand system for 2 weeks while the dealer waited on a solution from Germany. I have never activated anything. The iPhone is not compatible with the comand online, maybe that is the issue. I also use an iPhone for music and phone, but when I want to use the internet I have an old Nokia living in the centre console that I use to connect to internet. I thought I'd add a few photos and relay details of my recent dealership visit in which I had the COMAND firmware updated in my 2009 C350 Sport W204 with the MELCO/NTG4 HU (version 11.02.00 which does not indicate year since it was factory-installed in my 2009). I also update the NAVTEQ maps to the latest 2012.2 v.10 edition. My vehicle has 2,000 miles remaining on the factory warranty. Having read this thread, I scheduled regular service and also mentioned that I'd like to have warranty service completed regarding the HU COMAND firmware updates. Per recommendations, I mentioned I was experiencing problems with the AUX low volume from the factory-installed iPod integration (which I never use, I have all my music on an SD Card), and that I occasionally have to "reboot" the system when it gets stuck on "Loading Speech Data." This was sufficient justification for the dealer. I also spoke to the Service Manager and showed him photos of the screens UCFBETA92 posted to prove I was missing the "boost" function which "fixes" the iPod volume issue. As an additional precaution, I also took a photo of the MOST error log found in the Engineering Menu as it listed a number of Fan/CD/Etc error codes. I figured at least I could prove there was something odd going on before service clears out the error logs. There's actually a lot of interesting information in the Engineering Menu sub-items for those that are curious. One note: It did take a few conversations with the original Service Advisor to get them to understand the difference between the NAVTEQ DVD maps updates and the COMAND firmware updates. The latter isn't something the average Service Advisor or customer requests very often if at all, so I'm not surprised some folks on this thread are having difficulty getting a straight answer from their dealerships. * I have the "skyline stars" effect in Bird's Eye view in Navigation. * I have the time showing in the upper left corner of the Navigation screen at all times now. * I have the analog clock under System|Time settings. * I have the AUX sound "boost" option. * I have an "Information" section now when listening to the radio, with stations that support HD FM (I guess) relaying over-the-air info like song information, DJ, etc. Not all stations support the information, but for those that do, it gives you a pop-up screen instead of just scrolling some of the info above the radio station. 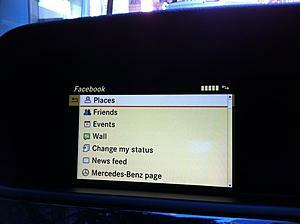 * I have an additional NAV menu selection called "Map Version" that lists the current NAVTEQ maps installed. * I have at least half a dozen new sub-menus/options in the Engineering Menu mostly related to hardware settings and diagnostics - also includes an "END" option which I didn't have previously (in order to "exit" the menu previous to the update I simply turned the HU off and back on again). * To exit NAV Full Screen, I used to be able to press the CLR button, but now I must press down on the COMAND joystick/knob. Line: 48036 Customer request check for update and perform if available for the COMAND unit. Updates available. Performed update on the COMAND unit. Saved information to paperless files." Is there anyway we can enable this COMMAND Online or the APPS? I'm in Canada with 2012 C300. 1. Did COMAND Online become compatible with iPhones yet or do I still need to keep my damn Blackberry for the BT modem? 2. Tried to use a 2012 map disc in Australia but apparently it requires you to input some kind of licence key before it installs. Anyone heard of this?